I want to be that person who invented egg salad and chicken salad. I mean, that person deserves a gold medal. Yummy, versatile, classic. How do you make yours? Even though this particular chicken salad has been floating around for ages, I was only introduced to it a few years ago by my friend, Kary. We were hanging out at her house and she made it for lunch one day. I was practically mesmerized by all the ingredients she was mixing together. It all seemed so odd…and yet wonderful. I knew immediately how much I would love it. I always just made mine with chicken, mayo, some seasonings, and lettuce. But I realized I had been missing out! I’ve been enjoying it this way regularly ever since. She just served it on its own, but I really love it as a sandwich. 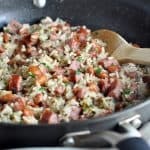 Other classic salad recipes you might like! Does the calorie count include the croissants, or is it just the salad. Just made this today. I accidentally got regular plain yogurt instead of Greek yogurt and it still turned out great! Love the crunch of the apples and the pecans! Delicious, first time I made it! I prefer to make it with less apples and more cranberries. The canned chicken has plenty of salt, will skip the 1/4 t salt next time. This is good chilled with a slice of provolone. Can anyone tell me how far ahead I can make up these sandwiches? I need something to hold up 6-7 hours before serving. Thank you. Hi Colleen – you could definitely make the chicken salad the night before, although the apples will discolor a bit. I wouldn’t make it much more in advance of that, though, because it could start to break down and get watery. I found storage containers with a drainage plate on Amazon. If you butter both pieces of the roll Or whichever bread you’re using, and, Or, place lettuce on both pieces and fill with the chicken salad, Then roll them tight in saran wrap and keep cold, you won’t have any problem keeping them yummy and fresh for several hours, though your pecans will soften somewhat, and unless you add a teaspoon or 2 of lemon juice to apples before adding to mixture, they may darken somewhat. Do the nutrition facts also include the croissant? No, because that is optional. Wow looking delicious. 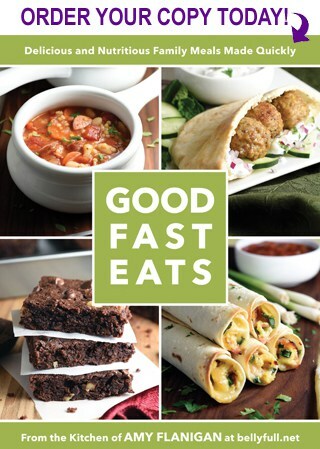 Wanna try it..
Do you think I could make it the night before my event? Or does it taste better made the same day? If ok to make a day ahead should I add the apples right before serving to avoid them browning? 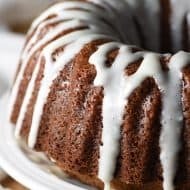 You CAN make this the night before, but I recommend making and serving it the same day so the pecans don’t soften and the mayo mixture doesn’t loosen. 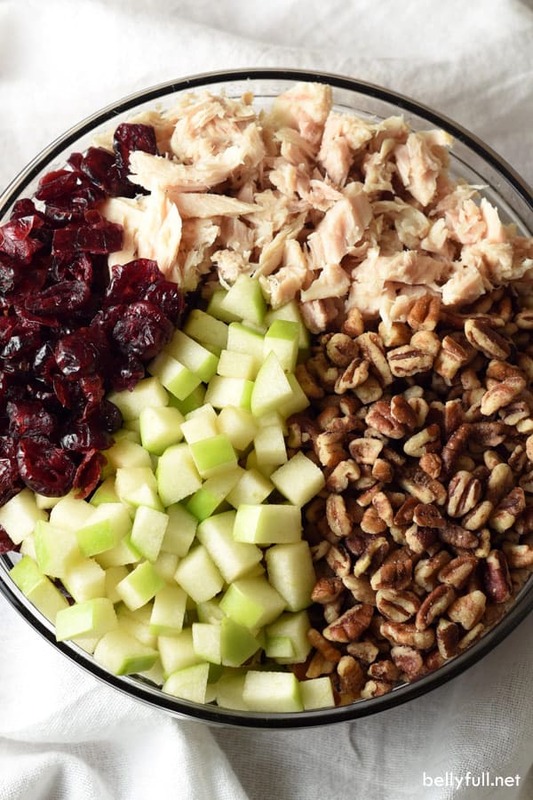 Add the chopped pecans and apple on serving day. Oh, try lightly toasting the pecans to enhance their flavor as well. 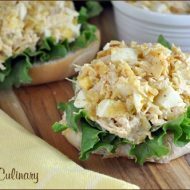 I make a similar chicken salad, but use lemon yogurt instead of plain. Makes a nice, light tasting dressing. Chicken quesadilla’s are always a big hit with us. Also chicken chili with corn muffins…totally yummy! There are online calorie counters you can plug the ingredients into, if you need that info. Thanks! 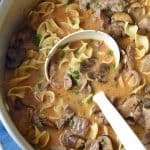 My husband absolutely loves this recipe!!! Your recipe sounds delicious ,I will try it. Thanks! You can substitute dried packaged cherry for the cranberries. I used sour cream and Greek yogurt instead of mayo. Added grapes, celery, and a small amount of red onion. Delicious !! Did you use all the ingredients above as well? This sounds amazing but I have a question. My son is severely allergic to apples. Could I substitute pears instead? Well, obviously it will be a completely different flavor, but I can’t see why not. Try it! What can I use in place of the yogurt?? I have been trying to adventure with different chicken salads lately because I got bored with my usual celery with grapes style. I saw this recipe and was excited to try it! It was everything I thought it would be! This is my second time making it and it is my familys new favorite! I use a rotisserie chicken and double the ingredients becaue we go through it so fast! I love trying different recipes for chicken salad & also tuna salad. Unless the recipe contains something I don’t like, I follow the directions as written. If I like the taste, I’ll continue to use that recipe. If not, I’ll tweak it to suit my preference, such as adding curry powder & I always use rotisserie chicken (white meat only) since I don’t like canned chicken. 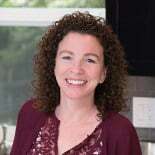 I’ll be making your recipe today!? I just fixed a chicken salad recipe & then found this one. I am looking FORWARD to using the recipe you posted. Buying a whole rotisserie chicken @ Sam’s for $4.99 is a real deal. A purchased chicken salad sandwich (even blah) costs that much or more. Now after using the breast meat from rotisserie….who will tell me what to do that will taste GOOD with remains of that rotisserie chicken, I really LOVE SOUPS. ANY GREAT IDEAS? I love rotisserie chicken. I like to boil the bones and then use the stock for either chicken noodle or chicken vegetable soup. I usually pick the rest of chicken and then add it back to the soup. It makes very tasty stock. I really like so many of your recipes. 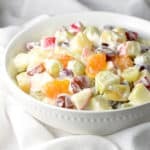 This looks really good and would like to try BUT I cannot STAND THE TASTE OR TEXTURE OF YOGURT. IT MAKES ME WANT TO THROW UP. Is there something that I can use as a substitute? Please answer, I would love to try this. Hi Rosemary – do you have a strong aversion to sour cream, as well? Because that would be an acceptable sub. If not, then you can always just use more mayo. It won’t be the same, but still good! You could use sour cream or more mayo instead of yogurt. How much cream cheese did you use and what did you replace the cream cheese for? I can’t eat mayonnaise and I was wondering if you could use the cream cheese in the place of the mayonnaise. I don’t like yogurt or sour cream either but would use extra mayo & add 2 tsp lemon juice. Think that would work…. I added some poppy seeds and cut up strawberries. I replaced chicken with tuna. It was delish! OH–I also used white pepper instead of black. Very yummy! Love the apple in there, so much extra flavor and crunch! This is funny for me as it is almost the way I have been making mine for years. I don’t put onion powder or mustard in mine and I use miracle whip light instead of mayo (diet restriction). Sometimes I add a pinch of curry powder. I have also added diced dill pickle. I may have to try the mustard add in. It is a delicious recipe and one can change or add ingredients to personal preference. Like if you don’t like pecans use slivered or sliced almonds. Don’t like Dijon mustard. Try yellow or if you can find it cranberry mustard. Like celery (I can’t eat because of the strings) throw that in. I think at times I have added diced onion, I know I do in my tuna for one of my recipes. I have also made tuna with the recipe above. (As you can tell I play around with it) I have also served it on pretzel buns and the sandwich thins. Try adding a few green or dark grapes cut in half. Scrumptious! I always use mayo and Greek yogurt, too! Your add ins are delish!! Served on a bed of baby spinach leaves, helps get more greens in the family diet. Offered options to add to the spinach, sliced radish, jicama sicks and seeded cucumber sticks. I added to the dressing a bit of celery and chia seeds, (a plant based protein source), and halved dk red grapes. I made extra dressing just in case the add ons needed more. Mini croissants served on the side from Winco bakery dept. Used a store roasted chicken with little salt added to it for the breast meat. Need to make enough for 40 sandwiches/people. Do you know how much of each I’ll need? Hi Melissa – since this serves 4, I guess I would just multiply all the ingredients by 10. So yummy! Had leftover baked chicken, made this for the hubby for dinner. I always mess up on the salt, though. End up putting too much. Or too little. Love this recipe. I made it the first time as the recipe suggests and the second time added a bit of crunchy celery (and the celery leaf.) FAB-ulous both ways. Thanks for sharing! OMG! Best chicken salad ever . Making it for a bridal shower. Thank You for sharing. Haha! That’s how I felt the first time I made it – love this salad so much. So happy to hear you do too, Pat! This looks so good !!! 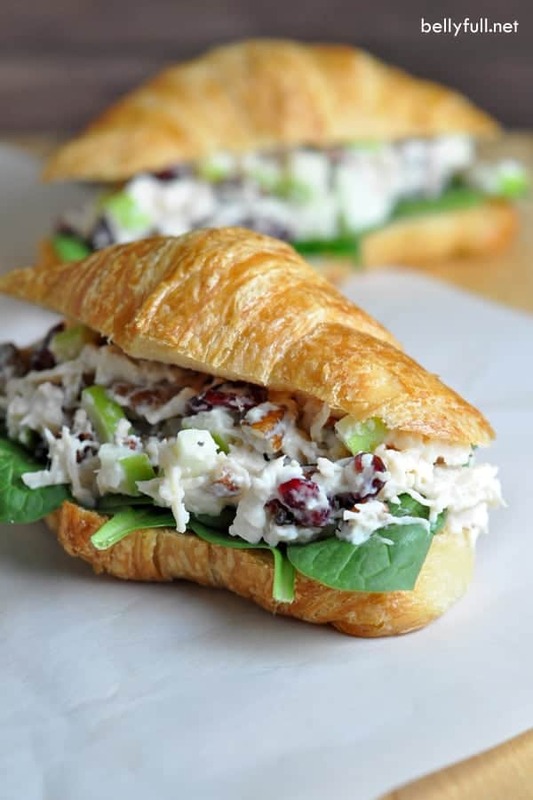 My Husband loves Chicken Salad and I have left over Baked Chicken from last night I will be making this today for his lunch all I need is to have him to go up to FoodLoin pick up a Bag Of Dried Cranberries. Thank you Very Culinary you made my hubbys day!!! this is yummy. Made it 2 days ago. How long do you think it will last in the fridge? Ideally 3 days, and no more than 5. Glad you liked it! This chicken salad sandwich was so good, I recently ordered one at Harris Ranch on a road trip. Although Harris Ranch is well-known for their beef, I thought I couldn’t go wrong with this sandwich, too. How disappointed I was when it didn’t compare to this recipe. 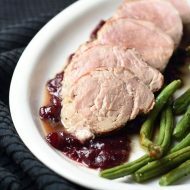 It was missing the mustard, cranberries and pecans, which turned out to really made a difference. They used red grapes but not enough of them and chopped the apple so small you didn’t really taste or get their crunch. Now I can’t wait to make this again. Oh, I totally agree! I haven’t had this at Harris Ranch, but I’ve bought it from the grocery store before and it’s always so bland. I do love the idea of grapes! I use more apple than that. Also, try finishing off the sandwich with toasted, sliced almonds. Not a lot, just a few on top of the chicken salad in the sandwich. Gives it a little extra crunch. Wow! I love croissants. I love cranberries and apples. I love pecans. Is there any chance I won’t love this sandwich? I can’t wait to make this! 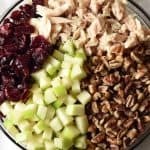 I absolutely love adding fruit and nuts to chicken salad! It’s a really easy way to make it a little more interesting and WAY less boring. Love the preparation on a croissant, too! Swoon. I haven’t always been a huge fan of chicken salad sandwiches until recently. 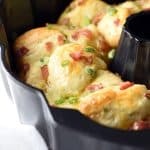 And there is not better way to serve them than on a crescent roll! YUM! I feel like there is so much about chicken salad that is made better by serving it on a croissant. I like your style. I crave chicken salad. It was something I had as a child only once a year. This is such a wonderful variation—-truly. I pinned it. Thank you! This sandwich is right up my alley. I love this combination and can’t wait to have it for lunch. My grandma always made chicken salad from the leftover fried chicken from their restaurant. I love it and especially love that you leave out the celery! Oh, that would be the best! But what’s “left over” fried chicken? HA. This looks so, so good! I wish I would have had that for breakfast this morning, yum! Right?? I love fresh croissants!